Celebrate with family and friends downtown this New Year’s Eve at the 13th annual award winning event, First Night Columbus. This family oriented alcohol-free event offers exciting activities for all ages. Sing and dance along to live music at more than 30 locations, participate in hands-on activities along with interactive games at indoor and outdoor venues and don’t miss the extravagant array of fireworks, kicking off the New Year, at midnight! First Night Columbus is currently seeking outgoing and energetic individuals to serve as volunteers for this year’s event. More than 250 volunteers, sponsored by Spaghetti Warehouse, are needed to help organize a variety of events. All volunteers will receive a free admission button, along with a T-Shirt, a coupon from Spaghetti Warehouse and other prizes from local businesses. If you are interested in volunteering at this year’s event and would like more information log on to www.firstnightcolumbus.com or contact Aaron Motley at 299-8704. Come to First Night Columbus and register to win two roundtrip airline tickets on Southwest Airlines! Participants must register on the day of the event but do not need to be present in order to win. Two drawings will take place each consisting of 2 roundtrip airline tickets. Buy your First Night Columbus buttons (the official admission ticket), at any central Ohio Fifth Third, Meijer, Cord Camera and COSI locations, or online at www.firstnightcolumbus.com. Looking for a safe, fun way to spend New Years Eve with other Central Ohio teens? The Teen Idol Dance Party, sponsored by Nationwide, at this year’s First Night Columbus is the place to be! Central Ohio’s most talented teens will battle it out to be named First Night Columbus’ Teen Idol winner. The competition begins at 8 p.m. in Veteran’s Memorial, in the Wayne Brehm Room, stay all night long for the dance party with music from DJ Trent. The 2007 Teen Idol winner will perform on the First Night Grand Finale Stage in Genoa Park before the fireworks at midnight! They will also receive free studio recording time, a Nationwide Insurance gift basket as well as a free dinner coupon and admission button. All Teen Idol contestants must be prepared with two songs, each under four minutes. Only one person can perform each number without using any musical instruments. Songs must be approved prior to the event through First Night to ensure appropriateness and that there are no duplications. Lyrics must be First Night appropriate: no profanity, sexual content, violence, or reference to drugs or alcohol. The three contestants with the highest scores will make the final round. The Teen Idol winner will be determined by audience applause. For information on entering the Teen Idol competition contact Tausha Carter at 679-1034 or e-mail her at teenidol@firstnightcolumbus.com. You can also find more information on www.firstnightcolumbus.com or by contacting Aaron Motley at (614) 299-8704 or by e-mail aaron.motley@gmail.com. First Night Columbus is a unique and entertaining downtown celebration that unites the Columbus public in a family-friendly and alcohol-free event. 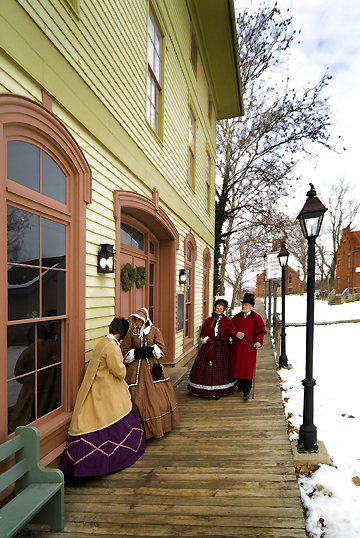 Step into the world of Charles Dickens and a Victorian Christmas celebration at Ohio Village. The Ohio Historical Society presents a series of festive holiday events in December at the Ohio Historical Center and Ohio Village in Columbus. "Dickens of a Christmas," takes place Dec. 14-15, from 6-9 p.m., and on Dec. 16, noon-5 p.m. Step into the world of Charles Dickens and the Victorian Christmas made famous in his stories from plum pudding to caroling to the characters from his writings. Admission for the family-oriented event is $11 for adults and $8 for students ages 6-12, and $9 and $6 for Ohio Historical Society members. Children ages five and under are admitted at no charge. At the American House Hotel at Ohio Village "Dickens of a Dinner" will be served Dec. 14-15 at 6 p.m., and Christmas Brunch at Ohio Village will be served on Dec. 16 at 11 a.m. and 2 p.m. While dining visit with the venerated author himself, Charles Dickens, and listen to traditional carols performed by the Ohio Village Singers. After dinner or brunch, take time to enjoy the holiday festivities in Ohio Village at "Dickens of a Christmas." Dinner is $57 per person or $47 per person for Ohio Historical Society members. Brunch is $35 per person or $28 for members. Brunch price for children ages 6-12 is $15.95, or $12.95 for child members. What happened to Scrooge after his Christmas morning reformation? Enjoy a holiday buffet dinner and help to solve the mystery by attending "Dickens of a Murder" on Dec. 21, from 7-9 p.m. Fee is $57 or $47 for OHS members. For reservations, call 297-2266 or 800-686-1541. The Ohio Historical Center and Ohio Village are located at I-71 and East 17th Avenue in Columbus. Parking is $4 per vehicle and free to OHS members. For information on all Ohio Historical Center and Ohio Village events, call 297-2300 or 800-686-6124 or visit www.ohiohistory.org. 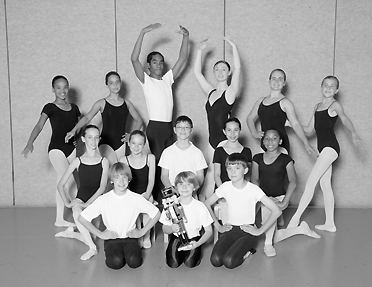 Eastside residents performing in Ballet met’s "The Nutcracker" Dec. 8-23 include, from left, front row, Ben Smith, Evan Cook, Simon Horn; second row, Carlin Coffey, Ariel Brodey, Collin Sparks, Jane Rosenthal, Jamilah Muhammad; back row, Alexandria Penn, Sarah Lazarus, Britton Stultz, Alexandra Gregory, Emily Reed, and Regan Detwiler. Students to perform in Ballet Met’s "Nutcracker"
Nearly 130 central Ohio students will take the stage in BalletMet Columbus‚ "The Nutcracker." Choreographed by Artistic Director Gerard Charles in collaboration with theater artist Robert Post, the holiday family classic runs December 8 -23 at the Ohio Theatre. Among the roles danced by the students are playful party guests, rambunctious mice, valiant soldiers and lively maids. Student cast members of "The Nutcracker" have been rehearsing since September at the BalletMet Dance Centre and in the BalletMet Performance Space. Along with beautiful choreography, opulent scenery and many touches of humor, BalletMet’s "The Nutcracker" features Tchaikovsky’s delightful score performed live by the Columbus Symphony and the unforgettable voice of actor Roger Moore. The Nutcracker performance schedule is as follows: Dec. 8, 2 p.m & 7:30 p.m; Dec. 9, 1 p.m.; Dec. 14, 7:30 p.m.; Dec. 15, 2 p.m. and 7:30 p.m.; Dec. 16, 1 p.m and 5:30 p.m.; Dec. 19, 7:30 p.m.; Dec. 20, 7:30 p.m.; Dec. 21, 2 p.m. and 7:30 p.m.; Dec. 22, 2 p.m. & 7:30 p.m.; Dec. 23, 1 p.m. and 5:30 p.m.
Free audio description is available for the 1 p.m. Dec. 16 and Dec. 23 performances. Reservations required through BalletMet, 229-4848. Tickets to The Nutcracker are $18.50 – $64.50 through the BalletMet Box Office (614.229.4848), www.balletmet.org, CAPA (469-0939), and Ticketmaster locations (431-3600). Tickets for MetPass members are $15.75 – $26.50. Discounts are available at all central Ohio Kroger stores and on specially marked Sierra Mist products. College students with ID can purchase $10 Student Rush tickets at the theater beginning two hours prior to showtime. Students age 13-18 can purchase $5 High Five vouchers at any Kroger Ticketmaster location. Group discounts are available at 586-8674. The 2 p.m .Dec. 21 performance is a special Salute to Seniors. Guests ages 55 and up can purchase the best available floor seats for just $26 through the BalletMet Box Office, 229-4848. Salute to Seniors sponsor is WMNI. •Meet "The Nutcracker" characters after the Dec. 9, 14 and 19 evening performances. Get an autograph or just say hello to select cast members. •Have their photo taken with "The Nutcracker" characters at each matinee before the show or during intermission for only $8. •Listen to caroling children’s choirs – Columbus Children’s Choir, Hilliard Davidson Madrigals and Hilliard Heritage Middle School Choir – in the lobby before performances. •Listen to the story of "The Nutcracker" read by favorite local celebrities 30 minutes prior to the matinee performances Dec. 8, 9, 15 and 16. Visit www.balletmet.org for a complete list of celebrity readers.